Welcome to the weekly deck building contest! 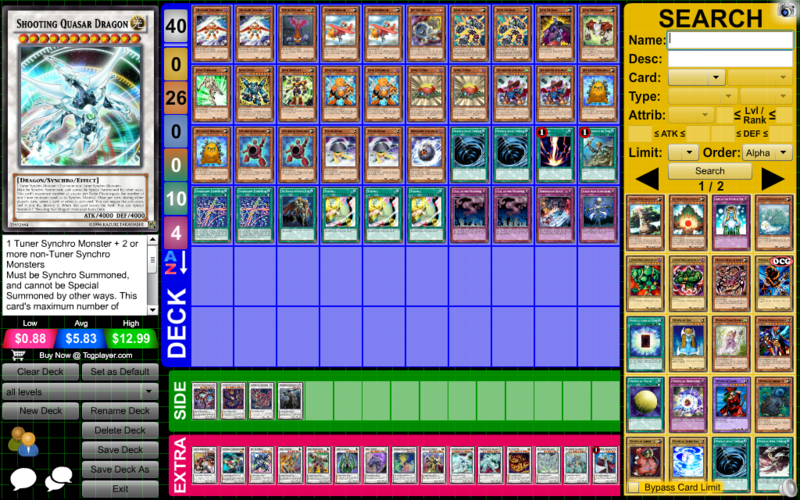 Congratulations to 6SAMS, who won the 11/20 Weekly Deck Building Contest with his deck, Duel Purpose! 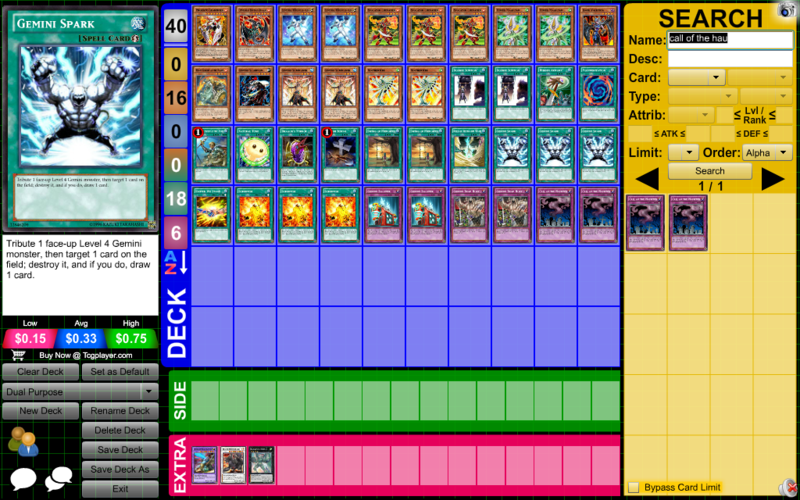 The deck is a fairly standard but synergistic list of Gemini monsters, allowing the Summon of the two major Gemini Extra Deck monsters, Black Brutdrago and Superalloy Beast Raptinus. The Xyz Monster used, Daigusto Emeral, also supports the group well, as it's capable of reviving any one Gemini monster with its effect! For winning this contest, 6SAMS, you receive your choice of 3 x Pre-Synchro Era or 1 x Pre-Xyz Era packs. Stomach, TLM, and Exarion, you each also receive 1 x Pre-Synchro Era pack as thanks for participating! Also, starting this week, the prizes will change, so please check it out!. Each member may submit up to one deck per week. Each round of the contest will last one week. The decks entered in a previous week's contest will be placed in a poll during the new week's contest. Comments on the decks up for voting are encouraged, but not required. Each participant will receive 3 x Pre-Synchro Era pack as thanks for participating. The winner will receive an additional prize of their choice of 3 x Pre-Synchro Era packs or 1 x Pr-Xyz Era packs. This week's theme was to build deck with every level/rank between 1 and 12. So the aim of this deck is to get a Tanngnjostr on the field in Defense Mode as often as possible. Gleipnir and Super-Nimble search it from the Deck, and Ayers and Oasis get it from the Grave. From my hand, I can Set him, then use A/D changer or Ancient Forest to put him into Attack and activate his effect on my turn. Brilliant Fusion can send A/D Changer, Guldfaxe or Turtle to the Graveyard, depending on what the situation calls for. It also gets out Seraphinite, which is great, because Normal Summoning twice is great. But it also allows me to Set too, so I can Set Jostr or Nimble, then banish A/D Changer to activate their effect. Ok, so that's how most of the deck functions, but how do I get out Red Nova Dragon? There's only one way, and that's by Summoning Malefic Cyber End Dragon, then getting out PSY-Framelord Omega and returning Cyber End Dragon to the Graveyard, and then Summoning Ghost Charon and using its effect on M-CED. However, Ghost Charon and M-CED work by themselves anyway, so I figured it was the best Level 12 to use. Heh, this was fun. I was pleased how little I had to force to fit the criteria. (Basically only Tzolkin, which is admittedly pretty bad here, Re-Cover and Psychic Tuning, which is here solely FOR summoning Tzolkin.) Multiple Destruction is primarily here to put Blaster/Assault back into the deck, but it's solid draw in its own right. Artwork. Hardly relevant to the game itself, but it certainly does give the game a little bit more charm than just words on a cardboard. Some cards get special treatment thanks to their popularity; especially the iconics, such as Blue-Eyes and Dark Magician, have several cards with unique artworks to their names. Some others, on the other hand, were subjected to censorship when they moved to the TCG. For this week's contest, make a deck using only cards that have alternate artworks. Edited by storyteller, 04 December 2015 - 08:09 AM. Edited by TheLaughingMan-JDS, 07 December 2015 - 09:21 AM. Edited by 6SAMS, 05 December 2015 - 03:59 PM. ^Claw of Hermos and Time Magic Hammer don't have alt art. Edited by TheLaughingMan-JDS, 05 December 2015 - 03:53 PM. My Life Points Don't Decrease Until I Say They Can Decrease. Got That? Did I really just run a Dark Magician Girl engine just so I could use Magician's Circle to get out one of my two copies of Injection Fairy Lily? Yeah. Yeah I did.